I’m sure Eryn hates being described as little, adorable and tiny, but all I can say is, I clench my jaw from cuteness-overload when I see her–similar to how I feel when I see a kitten. But just because she has adorable fashion sense and is the size of something I could throw over my shoulder like a continental solider, she is a GIANT in the department of world changers. May some of her love, energy and enthusiasm to serve the unseen and the brokenhearted rub off on all of us today as you hear about the illumination moment that led her to make a difference. 1. What is So Worth Loving? At its heart, So Worth Loving is a worldview and a positive way of thinking. I saw the lack of love people have for themselves and wanted to make a difference in their life. SWL is a brand that makes a point to remind you to love yourself and to love people–to treat yourself with respect, patience, and grace. Each of us knows what it’s like to feel unloved or degraded. Sometimes those feelings are fueled by the mistakes we’ve made or because of the pressures of those around us. With that in mind, we strive to develop products that encourage you to think differently of yourself and challenge your friends to think differently as well. We truly believe that there’s restorative power in knowing and owning that you are worth loving. 2. Was there a “light bulb moment” when you knew you had to start this project? As a recording artist, I have always had the desire to empower people by reminding them to love themselves and pursue their dreams. So when I dreamed up my first “band shirt,” I played with the phrase “so worth lovin” for a while by screen-printing it on my own shirts. That then grew into screen-printing my friends’ shirts, which then grew into me screen-printing their friends’ shirts. So I realized that I could also probably do this for random people I didn’t know to simply spread love everywhere. I started a blog, spread the idea, and sure enough, I had girls from all over the world sending me their personal shirt for me to screen print. When it wasn’t just my friends supporting me, but girls that needed to hear this and believe in it, that was the turning point. That was when I knew I needed to start an official brand. In my mind, So Worth Loving has become a community of soft hearts, broken spirits, stubborn and vulnerable people like me who love fashion at the same time, and want their style to make a difference. 3. What are some unexpected things that have resulted from this project? Starting So Worth Loving caused me to look at my life more internally. It wasn’t until other people started pouring their hearts into my inbox and being vulnerable with me that I started becoming more aware of the things I have stuffed down and the unwanted feelings I ignored. There was beauty in facing issues that needed to be dealt with. I wasn’t alone, and I had a whole community that affirmed that. I experienced grace and forgiveness to a fuller capacity than I ever knew existed. Over all, I learned that when others shared their stories, it inspired me to look into my life and see the beauty over the pain. 4. Are there people in your life that you go to for counsel as you pursue this and your music? Yes! I didn’t set out to start a clothing company–it just evolved–and next thing you know, I am musician that owns a clothing company. Being a musician I am not the most organized or structured person. I am free spirit that could give a hoot about details. There were days when I had 3-day-old hair and wore the same outfit twice in a row because I hit the snooze button too many times. But now I have morphed into a professional that will tackle her day like a champ! At least most days! How did that happen?! I wouldn’t have developed the skill set I have now if it weren’t for the people pouring their wisdom into me and being an incredible example in my life. To name a few: Jared Erickson, Reggie Joiner, Jeff Shinabarger, Ben Habeck, Gisele Nelson, Jeremy Blume and Craig & Juli Eddy. 5. Is there a recent encouraging story from your community that you can share? It would be so hard to pick one story but I will say that I have seen people who have bravely shared their stories of low self-esteem, verbal abuse, physical abuse, eating disorders, substance abuse, suicide, hard family dynamics, or damaging behavioral habits. They shared their story because we believe that by doing so, they are affirming someone’s feelings and giving them a glimpse of hope. The journey may be tough, but you will get through it. Hold tight to determination and grace. 6. How can people join this movement? This is not an exclusive club. So Worth Loving is for everyone and their mom! If you have a beating heart, you are in the family! Anyone can be involved. Place this hashtag in your Twitter bio (#swlfamily), wear a piece of clothing that will spark a conversation and be brave. Share your story here. 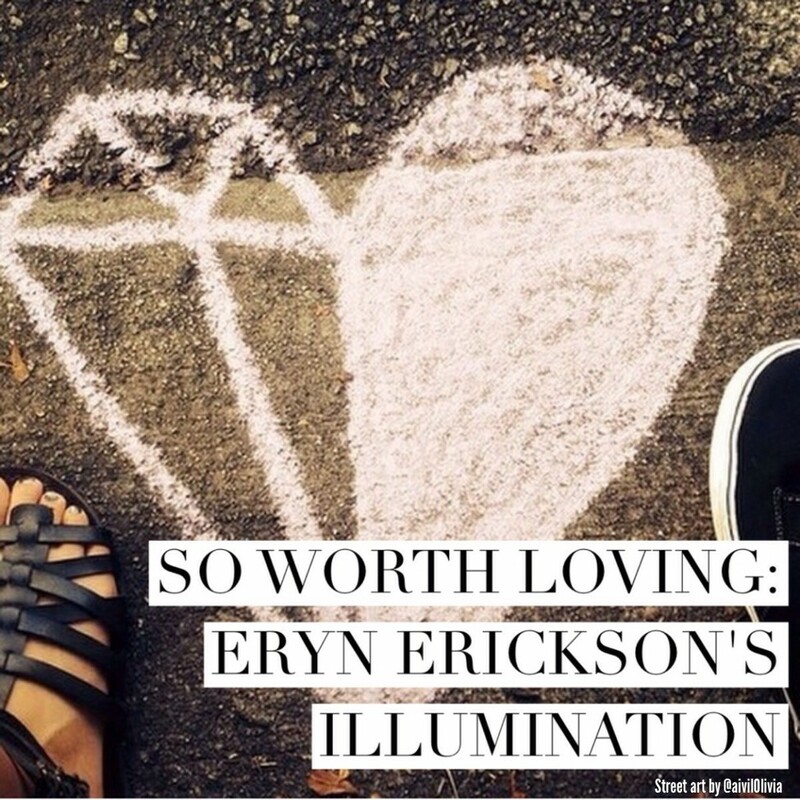 Social entrepreneur and creative, Eryn Eddy Erickson is the founder of So Worth Loving– a lifestyle clothing brand. Since it’s start in 2011, Eddy has since grown So Worth Loving into a notable company that has sold to all 50 states, 15 countries, and continues to garner a growing presence of over 24,000 across social media channels. Eddy and her work have been featured in publications such as CNN headline news, MSNBC, Mashable, Jezebel Magazine and Mollie Makes Mag. She lives in the heart of Atlanta with her husband and best friend Jared and their French Bulldog Sprocket. Learn more about So Worth Loving HERE. Follow Eryn on Twitter HERE and So Worth Loving on Twitter HERE. Check out Eryn’s website HERE and her music HERE. This is AWESOME! I hadn’t heard of So Worth Loving before, but I am now in love with it! What a wonderful and powerful message! I can’t wait to support it!